We stayed at a 500-year-old temple that has been converted to a hotel. It is on the edge of the old city and was quite convenient for our treks into the old city. We had the courtyard nearly to ourselves. Note: This is Char’s account of our anniversary trip to Beijing. June has been busy for us. Before school ended for me in mid-month, we made several weekend trips to nearby cities, met friends for dinner and did a teacher-training workshop. When school ended on June 13, our activity ramped up. And it hasn’t slowed down. The fast train to Beijing–a very comfortable 5-hour trip–got us off to quick start to our next three weeks of travel. My teaching colleague, David, joined us for our 3-day stay in Beijing. Xiaowei, the local tour guide we had engaged, met us at the train station and took us to our hotel, which was a 500-year-old temple, converted to a hotel. 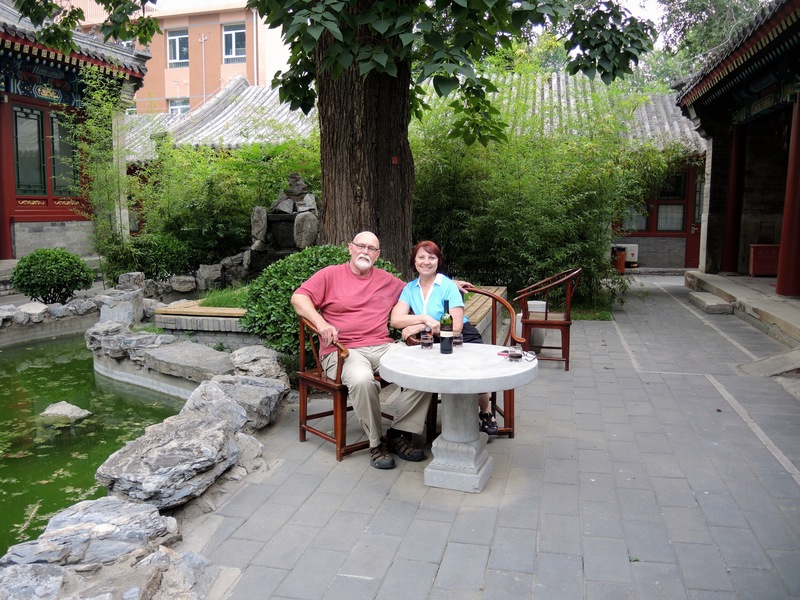 When Xiaowei discovered we were celebrating our 40th wedding anniversary, he got us a room upgrade to a very small room off of a beautiful quiet courtyard. We had the courtyard to ourselves for most of our stay. Xiaowei left us to get settled in for the evening with an appointment to meet him in the lobby at 8:30 the next morning. The following morning, Xiaowei surprised us with two bottles of red wine (and a corkscrew) to celebrate our anniversary. We stowed the wine in our room and went off with the tour guide for our day’s adventure. Xiaowei took us by city bus to the end of the line, which was conveniently across the street from Tiananmen Square, our first stop for the day. We walked off the bus and walked immediately into Tiananmen Square. I think Xiaowei took us in the back door because, as we entered the square, we saw hundreds of people lined up at the main entrances waiting to go through the tight security stations. Tiananmen Square was a bit eerie for us. We had the definite feeling of being watched. While it was full of tourists, the security cameras were everywhere. We counted eight or ten cameras on every light post and there were probably 20 or 30 light posts in the square. In all our time in China, this is the only time I really felt like I was in a communist country. The square is huge and we got a good feel for the terrible tragedy that occurred there in 1989. We were also struck by hundreds of Chinese tourists lined up to get into the Mao Zedong Mausoleum. Mao is revered here, especially by the older generation. After Tiananmen Square, we walked across the street to enter the Forbidden City. Neither Joe nor I had any idea that this place was so expansive. It is blocks long with multiple buildings. During the Ming Dynasty (1368-1644) there were 10,0000 servant girls and eunuchs who lived here to serve the emperor and his family. 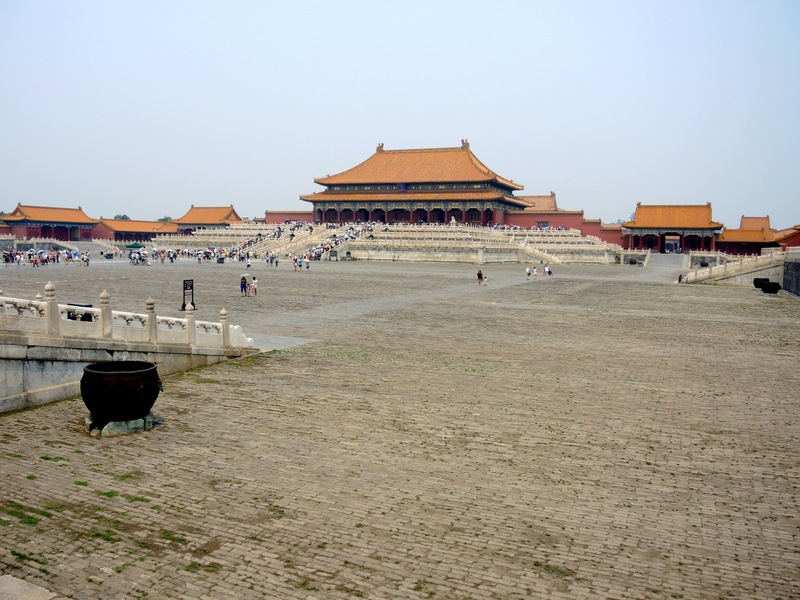 Covering approximately 180 acres, the Forbidden City is a complex of 980 buildings. It was completed in 1420 and subsequently used by 24 emperors until 1911. The city is surrounded by a wall which was surrounded by a moat. The buildings are intricately constructed. Nearly every detail of every building seems to have some salient meaning. As huge and expensive as it must have been, it didn’t seem very accommodating to daily life. In a way, it was like a prison. During the Qing Dynasty (1644-1912) the emperors pared back their servants and eunuchs to 3000. We were struck by the many elaborate ceremonial structures in the city that were only used a few times a year. When the Forbidden City was in use by the emperors and their families, security was a big issue. We decided that we were glad we were not members of the ancient Chinese imperial family because the emperors spent a lot of time trying not to be assassinated. The Forbidden City is so huge and elaborate for one family. To me, it was fascinating to see but way overdone and wasteful. It is easy to see why most of the emperors were not beloved by the ordinary citizenry. 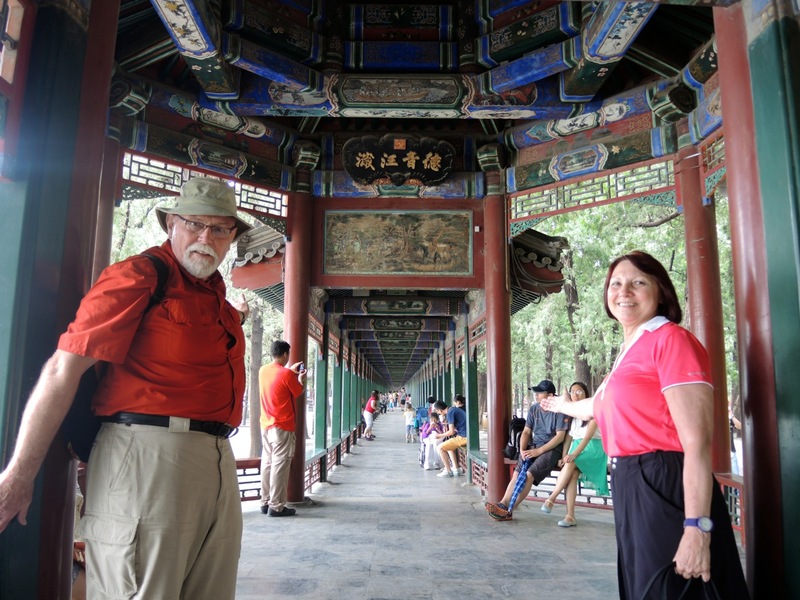 As an aside, this first day of sight seeing in Beijing was very hot–100 degrees. All of us were soaking wet from sweating in the heat. We drank massive amounts of water to stay hydrated. Fortunately, bottled water is sold everywhere. After leaving the Forbidden City, Xiaowei walked us through a local hutong or neighborhood made up of narrow streets or alleys. We walked this route to a local restaurant for a late lunch. This little aside provided a good picture of everyday life in Beijing away from the tourist centers. Exploring local neighborhoods and restaurants is one of our favorite parts of travel. We were tired after our first day of sight seeing in Beijing, more from the heat than anything else. We did manage to walk down the street from our hotel to a little dumpling restaurant for dinner. After that we enjoyed a glass of our anniversary wine and turned in early to get ready for an early start the next day. The next day was June 16 in Beijing but June 15 (our wedding anniversary) in the States; we chose this day as our 40th anniversary day. And what a day it was! Xiaowei met us in the hotel lobby. We got in his car and drove into the countryside for about two hours. It was a beautiful day and a beautiful drive. We loved going through the little villages with people making their trips to the markets and businesses open for the day. Farmers were working their fields and we saw many beekeepers along the way. We eventually arrived at a tiny village called Huang Hua Cheng, or Yellow Flower Town. Xiaowei stopped at what appeared to be an old hotel. We left the car in the parking lot, made a potty stop and walked to some steps that would lead us to the Great Wall of China. At the top of the steps was a restaurant where Xiaowei paid a small fee that allowed us private access to the wall. We took a path that started between two buildings and began a rather perilous trek up a switchback gully washed into the side of the mountain by frequent rainstorms. Our footing was often tenuous in the loose sand as we climbed. After about ten minutes we were on the Great Wall. This was such an emotional moment for us. Here is a site that we have read about and seen pictures of for most of our lives and finally we are standing on it. We were completely alone. That’s right–Xiaowei, David, Joe, and I were the only four people on this part of Great Wall of China. We were on an unrestored part of the wall far from the throngs of tourists and souvenir hustlers. It was perfectly quiet at times and we were seriously awestruck at the site of the wall running through the mountains in front of us and behind us. We spent many moments just gazing at what was before us. And we took advantage of the photo opportunities in front of us. 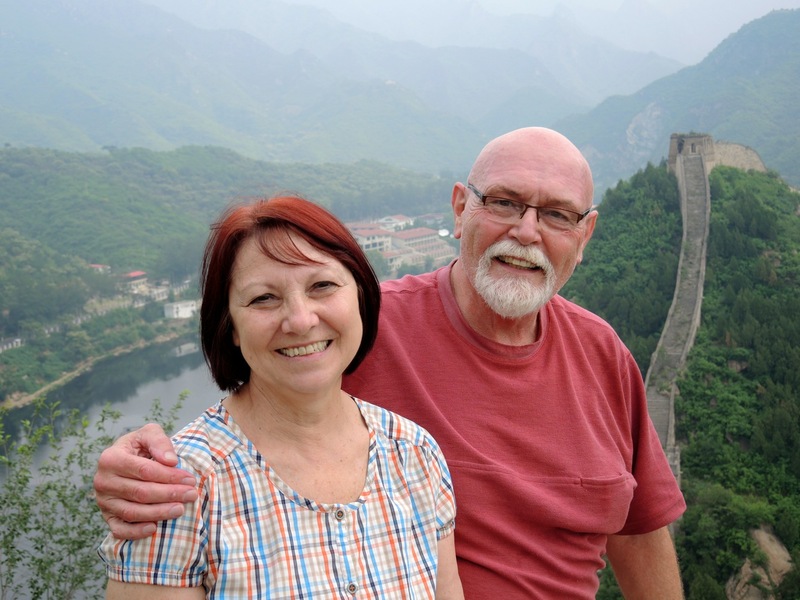 We celebrated our 40th Wedding Anniversary on the Great Wall of China. How cool is that! What an amazing site to see. It is a marvel of engineering, although it never really did achieve its intended purpose of keeping the Mongols out of China. After a bit, Xiaowei said, “Okay, are you ready to climb? You can walk up the steps on the edge of the wall or you can climb the ruins in the center of the wall.” Xiaowei chose the steps on the edge. We chose to scramble up the ruins in the middle of the wall. It was an uneasy climb with loose stones and bricks making our footing insecure. But we managed to make it to a more stable part of the wall about 50 feet up. We sat there on the steps for a long time just appreciating what was in front of us. Xiaowei kept us entertained with history and stories and picture taking. (Did I tell you that Xiaowei has a great sense of humor?) After about 90 minutes on the wall it began to sprinkle so we started our descent off the wall. 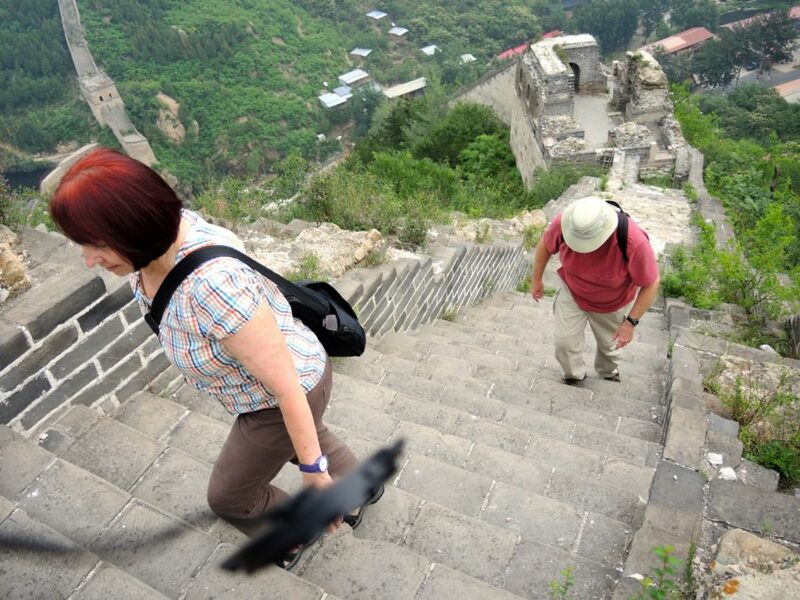 Climbing the Great Wall is a challenge. We’re glad that we did it while we are still able. It is a worthy endeavor; do it while you can. I cannot begin to express the range of emotions this escapade to the Great Wall evoked in me. It was inspiring and amazing. Joe and I expressed several times that we could hardly believe that for 90 minutes the Great Wall of China was ours alone. Neither of us could have asked for a more romantic way to celebrate our 40 years together. After our climb down from the wall, we had a great lunch of grilled trout, various vegetable dishes and cold beer. On our drive back to Beijing, we drove around The Bird’s Nest, the stadium built for the 2008 Olympics and then returned to our hotel. We found the Summer Palace to be much more habitable than the Forbidden City, as did the emperors much of the year. The Long Corridor is just shy of 2,400 feet long and contains around 14,000 pieces of art. A cool breeze from the lake provides a modicum of air conditioning, a welcome respite from the 100-degree heat of June. Our third day began by meeting Xiaowei’s charming fiancé, Xiao Xia, who would be our tour guide for the day while Xiaowei drove the car and managed drop-offs and pick-ups for us in the expected rain. Our first stop was the Summer Palace. Because the temperatures were cooler here in the summer, the emperor and his household lived here for about five months of the year. The royal family, the concubines and the servants all made the 22-mile journey to the Summer Palace. The grounds are beautiful. There is a wonderful cool breeze that comes off the man-made lake and cools the covered corridor, which is 728 meters long and contains 14,000 paintings; it makes for a pleasant stroll. But again, it is all so opulent and overdone. It is amazing that all of this was for the elite few while the rest of the citizenry struggled. Our last stop of the day was the Temple of Heaven. The emperor built this temple to pay tribute to a God. The temple and the grounds are beautiful and well preserved, but were only used by the emperor once a year. Seems a shame! Today, however, it is a park open to the general public. We saw many senior citizens playing cards and chess and enjoying each other’s company in a beautiful park. We did love our tour of Beijing and the Great Wall and it was all made better by Xiaowei’s knowledge and explanations of life in Imperial China. We spent our last evening at our hotel where Joe and David and I shared a bottle of wine as we processed all we had seen and learned in the last three days. The next day we would all be off to the airport; David to go back to Minnesota and Joe and I to travel to Southeast Asia.